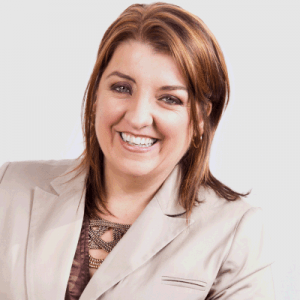 What can an InnerLifeSkills Master Coach do? Imagine being able to talk to someone for 10 minutes to 6 hours, and NOT GIVE THEN ANY advice, but still change their life? Imagine being able to inspire, motivate and help people to help themselves? 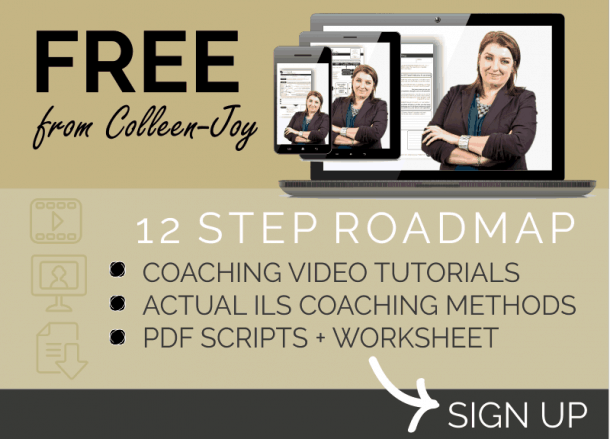 I’d like to help you to understand what an ILS Master Coach can do? 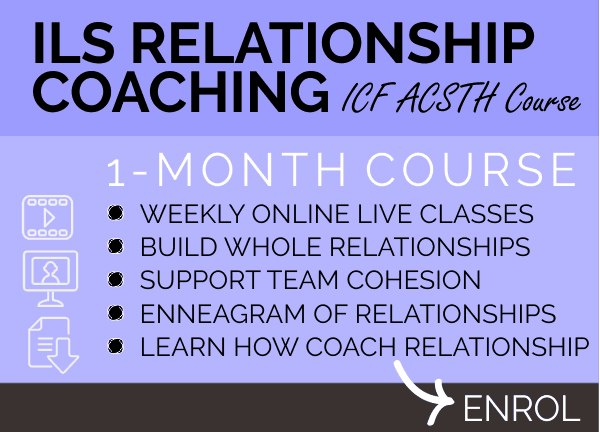 Many years ago I noticed that even ICF certified coaches struggled with one common issue, they often battled to coach people over their inner obstacles. Sometimes a professional is taught to challenge the clients limiting beliefs. But can you see how these two approaches could get you in trouble? I’ve even heard of professional coaches becoming angry and frustrated with their clients, when they didn’t stick to their actions, or “fell off the wagon” when they were derailed by their inner obstacles. This is why 20 years ago I consistently worked to create a toolbox for professionals that would help them to face their inner obstacles of their clients. InnerLifeSkills Coaches are equipped with over 50 processes so that they can truly help others to overcome their inner obstacles. 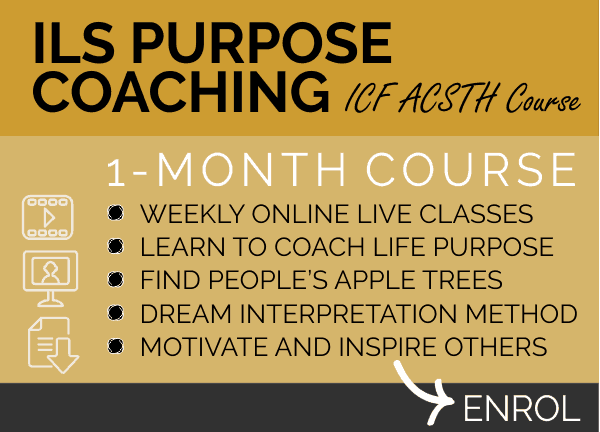 InnerLifeSkills coaching combines ICF core competencies with our own unique methods and processes. We specialize in helping you to overcome inner obstacles and to free inner wealth — hence our brand Inner Life Skills. 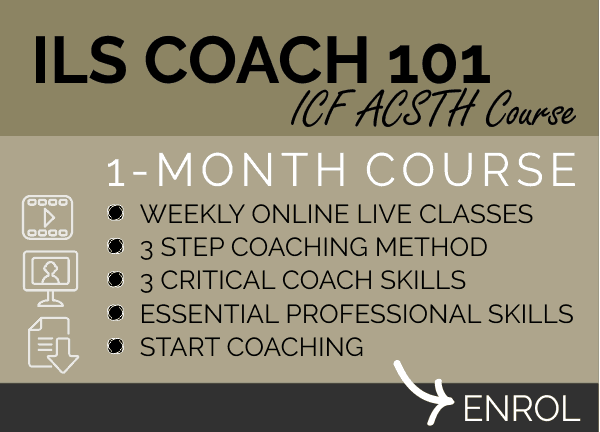 (which all ICF certified coaches have). 52 ILS unique coaching processes, with professional worksheets and coaching scripts. 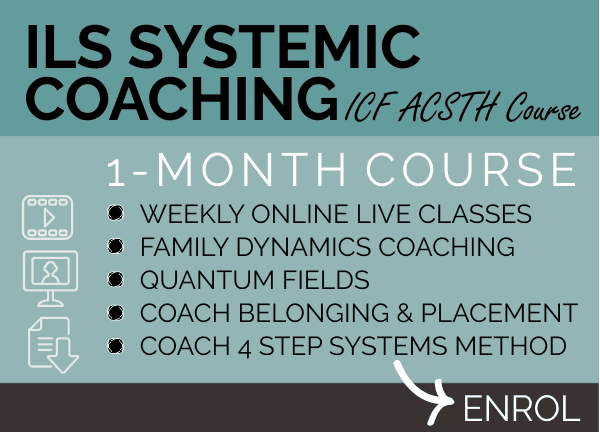 An ILS Master Coach can also empower others to build their inner wells, overcome their inner obstacles and find their inner wealth. I saw that many aspiring visionaries were only trained in styles and methods to coach individuals, and were only given one or two processes to use. Some coaches are even restricted, boxed into one style of coaching which severely limits their choices. Because I want people to go out into the world and make a positive difference in as many places as possible, I created this methodology to be plug and play. 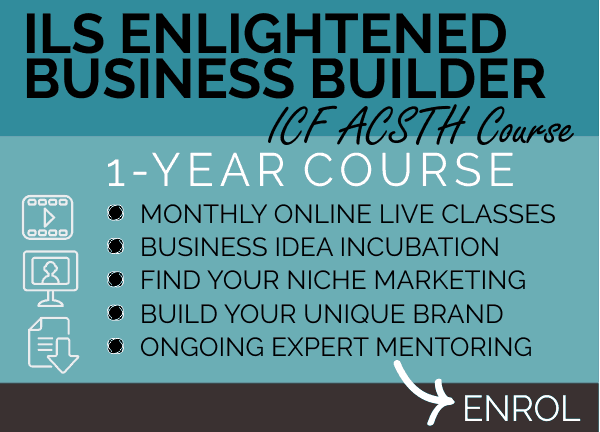 So that you can use your skills to change lives in every facet of life. 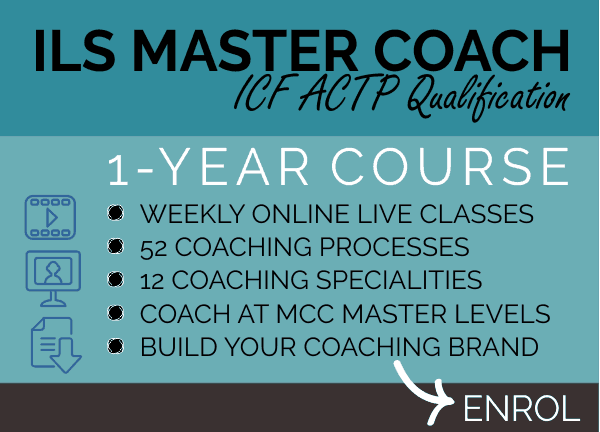 A qualified ILS Master Coach can coach at MCC levels, and they also have a coaching toolbox with 52 coaching processes and 111 coaching techniques. 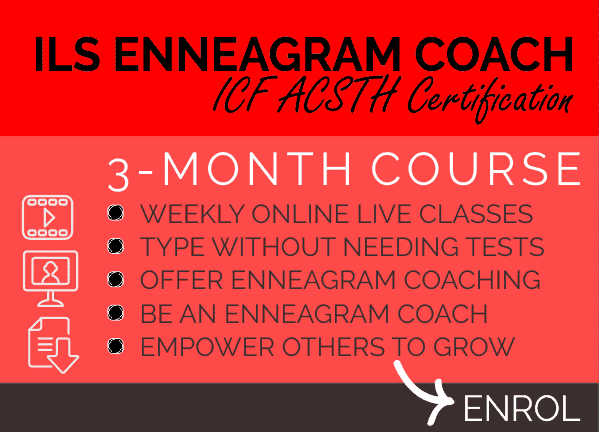 Any type of coaching (we’ll help you to choose a specialty) – including life coaching, business, executive, youth, wellness, personal growth, spiritual, organizational, talent development, etc. Pure coaching or blended coaching, where you add your own expertise and mentoring. 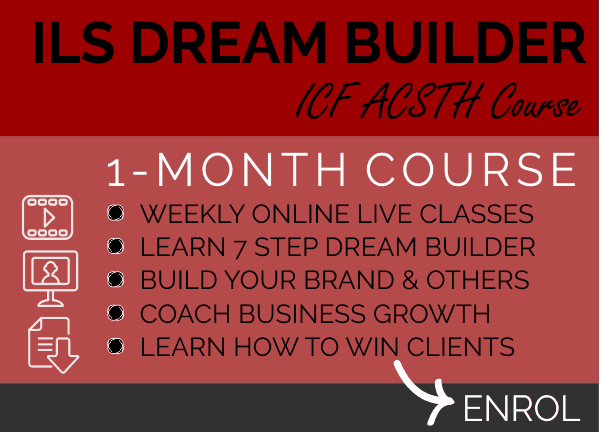 Any topic, goal or dream, inner wisdom, relationships, financial freedom, self-empowerment, creativity, business building, career transition, time management, motivation and more. 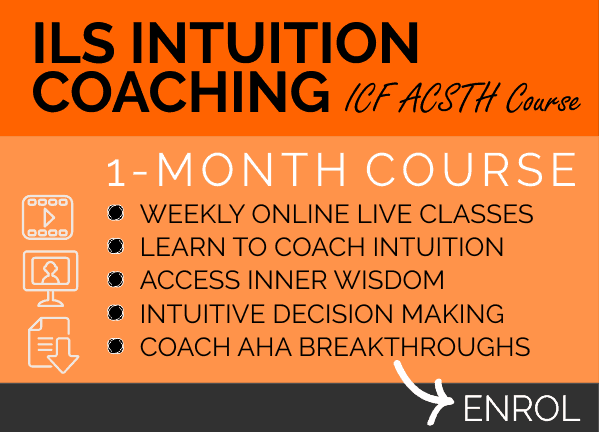 Whichever life coach course you ultimately choose, make sure that your training does not restrict you, so that you are left with only being able to coach one type of coaching, for example life coaching, and make sure that you have a substantial coaching toolbox so that you can coach any topic. 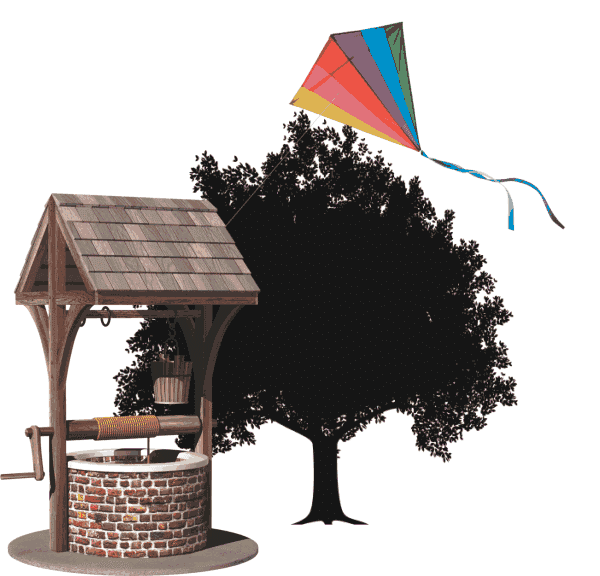 Build inner wells, fly kites and grow apple trees! 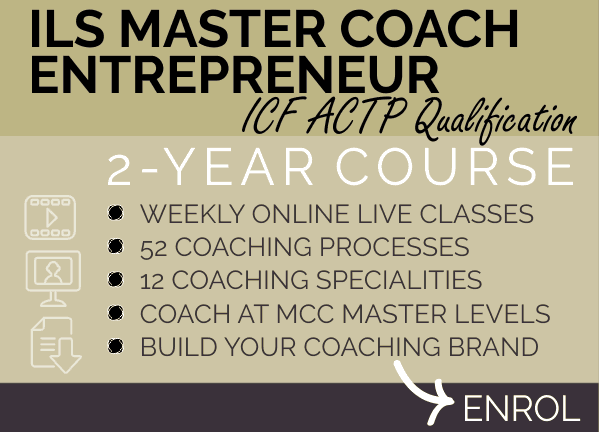 The 3 special things an ILS Master Coach can do! 1. BUILD WELLS. Empower others to find their own inner wealth. Picture a well. Beneath the rocks and ground is clear crystal water. The water represents our inner wealth. Our talents, solutions, strengths and wisdom. To get to the water we need to carve through the rocks, need to send down buckets. So we build a well. As InnerLifeSkills Coaches we use the inner well as a metaphor for our style of coaching. 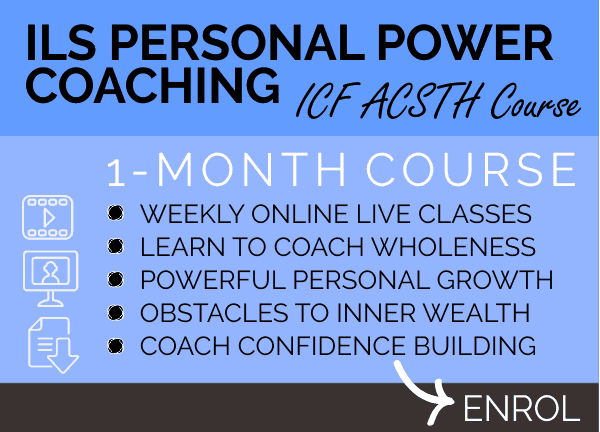 Because we want you to be able to build inner wells first for yourself and then for everyone that you coach. Instead of giving people your own water all of the time, and risk drying up your well, we teach you to help others to find their own water. This is true empowerment. We give you more than 52 blueprints (processes) for different wells. Each process gives you a way to help others to access their inner wealth and to help others to overcome their inner obstacles that are preventing them from finding their inner wealth. The buckets are the questions we ask. If we ask poor questions, this is like sending a leaky or small bucket into the well. A powerful well crafted question can draw out more water. As a coach you will learn how to ask empowering well crafted questions. Amazingly, some coaching methodologies in the world don’t teach you how to empower people to empower themselves. They tell you to give your water away every day. But carrying people’s burdens and relying on our own water is taxing, and it doesn’t empower others. When you help someone to find their own water you give them the gift that lasts for the rest of their life. Because now they know that they have inner wealth. They discovered it and you help them to do that. This is why InnerLifeSkills coaching is life-changing. 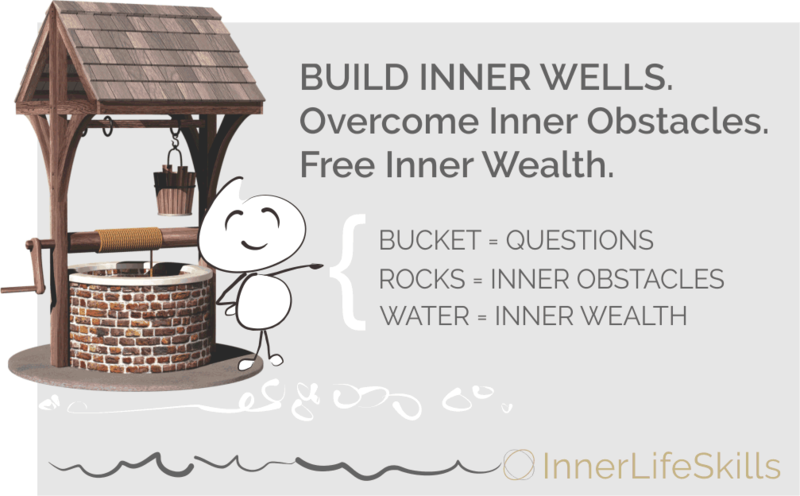 An InnerLifeSkills Coach can build inner wells, help people to overcome their inner obstacles and find the water of their inner wealth. Try this experiment. It’s something I teach all of my coaches. Look around the room and try very hard not to see the colour blue. Really put the effort in, try harder to look around but not to see the colour blue. So what happens? What happens to the colour blue when you try not to see it? Doesn’t it go softer immediately and disappear? No. It gets more powerful, it dominates your vision, it takes over, it gets all the power. It’s the same as trying not to think of the song that keeps playing in your mind — right? If we want to overcome our inner obstacles and to help others to do the same we need to understand this important reality about the way the mind works. When you push the mind it pushes back. That’s why I created a coaching process which is unique to InnerLifeSkills and helps our coaches to coach inner obstacles. So where did the ILS Kite process come from? I remember as a child spending a few hours with my father building a kite. “It won’t fly properly if it’s not balanced,” my father said. Carefully, we made sure that the kite was balanced. Years later, when coaching tough negotiations, conflicts and looking for ways to help my clients to overcome their biggest inner obstacles like procrastination, self-doubt, fear, laziness, indecisiveness etc. I remembered my father’s kite and how it had flown beautifully because we took the time to balance it. Within each of us are polarized dynamic forces. When we strive for a goal, isn’t it true that something inside of us often tries to sabotage our progress? We want to eat healthier but suddenly the desire to eat junk food gets stronger 🙂 We promise ourselves to go to the gym and then find our energy levels low. We try to be patient in a relationship and struggle with our impatience. What I realized is that every goal is potentially sabotaged because of an inner conflict between two opposing forces. Like the two sides of the kite. The vertical stick of the kite represents our path, at the base is where we are now – and the top of the kite represents our goal, where we want to be. Along our journey to our goal we hit the crossbar. The crossbar represents a polarity. 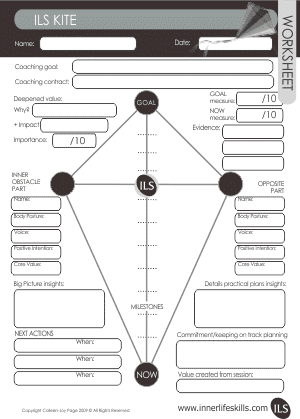 Here is our ILS Kite process Worksheet which all ILS Master Coaches learn to use to help their clients to transform their inner obstacles. Two opposing forces lie within us. For example the part of us that wants to eat junk food in opposition to the part of us that wants to eat healthily. The part of us that wants to be patient versus the part of us that feels impatience. The part of us that is frightened versus the part of us that wants to trust. What most people think they should do is try to eliminate the inner obstacles. They tried to kill procrastination. They try to get rid of fear. The try to suppress laziness. But this never works, does it? Like trying to get rid of the colour blue, by pushing against fear we make ourselves more frightened. By trying not to be lazy we make ourselves lazier. By trying not to want to junk food we make junk food more powerful. So instead of trying to get rid of the inner obstacles, we need to transform it. We need to include it. It’s like balancing a kite so that it can fly. InnerLifeSkills Master Coaches know that it is important to do this; a process that takes between 15 and 30 minutes. It’s called the ILS Kite. You will learn to find the positive intention behind destructive and limiting behaviour so that you can leverage the positive intention to help somebody to transform their inner obstacles. This works really well. 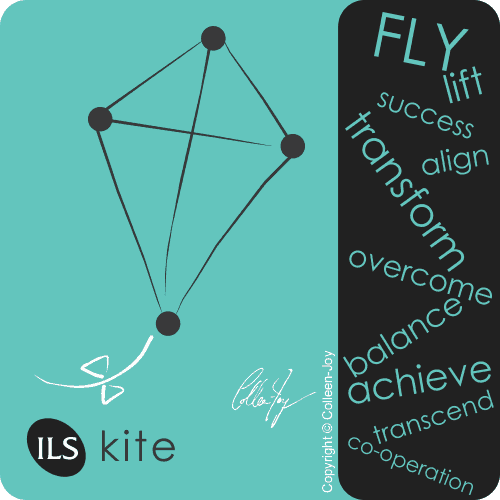 The ILS Kite is a metaphor and process that we teach, to help you resolve inner and outer conflict. Turn opposition and tension into the dynamic power needed to fly dreams to success. Our ILS Coaches use this process in tough negotiations, relationship disputes, conflict management, personal development coaching, to drive organization policy change and to catalyse corruption. Everyone has inner wealth—solutions, talents, strengths and aha’s waiting to be discovered. 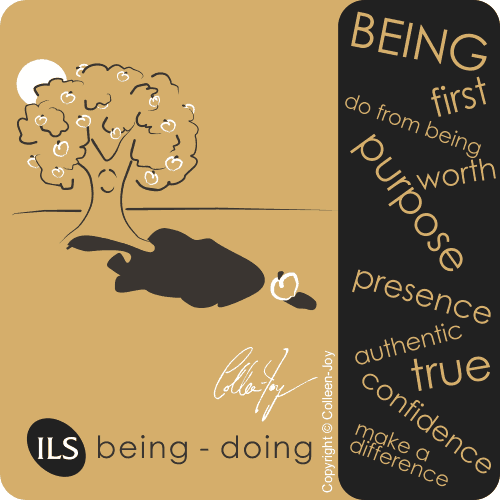 InnerLifeSkills coaching methodology teaches you how to build inner wells, transform inner obstacles and liberate inner wealth—first for yourself, then for everyone that you coach the ILS way. 3. Grow Apple Trees. Help people to find an inspiring purpose. Without purpose we feel lost. We feel like we have no direction. If you want to change lives, it’s important to learn to help people to find a sense of purpose. But, in my opinion there are a lot of big mistakes that people make when trying to coach purpose. The classic traditional way to guide others is to ask them to find their passion and inspiration. This would work for some, but not for all. Some people don’t relate to the word passion. The second biggest problem is that most people think of purpose as something they are supposed to do. They are looking for a ‘doing’. They are hoping to find the right thing to do to give them fulfilment. It is true that our world equates worth to doing. You’re only as worthy as what you can do. If you do less you are worthless. So when doing is threatened our self-worth is threatened. This is why a lack of a sense of purpose is so soul destroying and debilitating. This is also why when somebody is ill or faces retirement or anything that will confine their career; they feel worthless. But there’s something fundamentally wrong with this approach. InnerLifeSkills teaches that life purpose is not attached to what we can or cannot do. This is not to say that doing is not important, the error is that we have placed doing first. It’s like saying that the child is the parent. The child comes from the parent; the parent does not come from the child. We make our identity based on what we do, instead of making what we do an expression of who we are. This is the problem see, we make our identities out of what we do. Meantime what we do is an expression of who we are. And what we are is so much more than what we do. The simple mistake can cause us to lack a sense of purpose. The metaphor I use to teach this is the apple tree. The apple trees purpose is to be an apple tree. That apple tree is on purpose whether it has fruit or not. An apple tree is already an apple tree even when it is still a seed. If an apple tree didn’t know it was an apple tree how would it know what to do? It might try to make oranges! If we don’t know what we are we won’t know what to do. Purpose lies in our true apple tree identity. When we know what we truly are, we free our apple tree purpose so that we can be who we were born to be. Doing flows naturally from the being. An apple tree naturally does what an apple tree is. 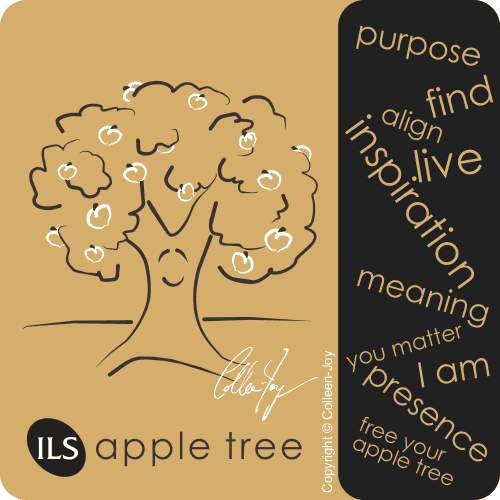 InnerLifeSkills Coaches are taught to coach this powerful empowering apple tree purpose metaphor. They are given 3 processes to use to help others to find and free their apple trees. This is one of the most popular processes that we offer. Our coaches love it. We have InnerLifeSkills Coaches coaching apple tree purpose in businesses to inspire the teams, to the youth in schools, to people facing inner obstacles and looking for direction. 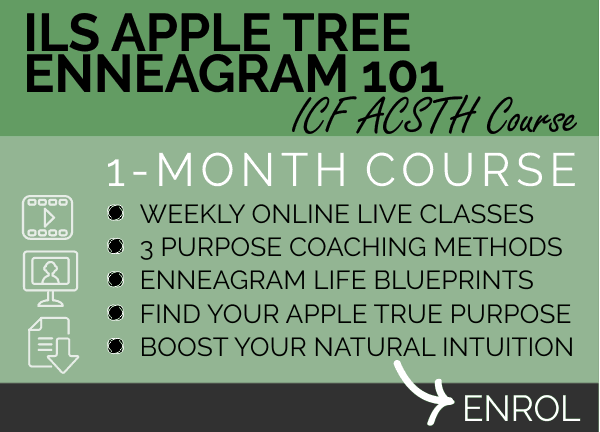 It can be life-changing for someone to find their apple tree purpose. 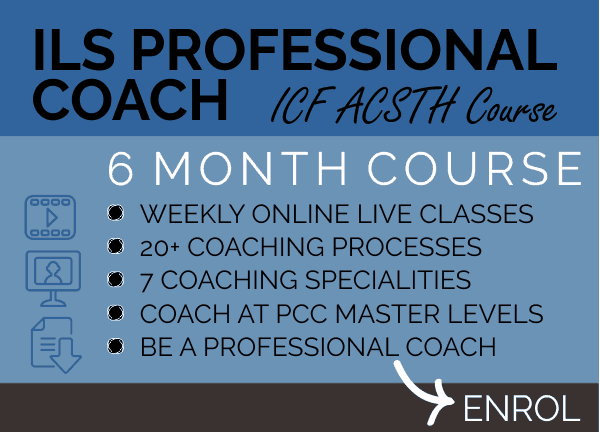 InnerLifeSkills offers this unique approach to all of its PCC and MCC level coaches.